We know the chemistry of the Earth and other planets nearby, and we can even deduce from distant stars from spectroscopic analysis of light. But the chemistry that takes place in the cold, dark clouds of gas and dust in the interstellar medium has still many unknowns. A new study of interstellar chemistry may have unlocked a few. A recent study conducted by astrochemists of Heriot-Watt University in UK, sheds light on this dark part of the universe, which show the key role they can play icy dust particles in the formation of one type of molecule organic precursor may be the pillars of life. By some estimates, the molecules are less than 1 percent of matter in the universe, but despite its scarcity may significantly influence the evolution of stars and planetary systems. Scientists suspect, based on infrared observations, that many of the dust particles in interstellar clouds are covered with a layer of ice. The ice acts as a refrigerant in the process of star formation, and their influence tends to promote the creation of smaller stars and live longer, like our sun. These stars, to be stable over a long period, giving more time planets to evolve, compared with which the stars are more massive and short-lived. Slow addition of stellar evolution, icy dust particles can also affect the interstellar organic chemistry, accelerating chemical reactions or molecules protecting the high-energy cosmic rays. Chemical behavior is the catalyst held by the interstellar dust that’s team is investigating astrochemist Martin McCoustra. Using frozen water surfaces and silica, the scientists created in the laboratory models of dust grains, both bare and covered with ice, and then bombarded with low energy electrons to mimic the effect of cosmic rays impacting on them. 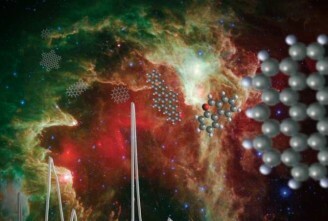 The researchers looked specifically at the effect of lightning on the acetonitrile, a simple organic compound that has been observed in the interstellar medium. And found that, in the films of acetonitrile, the incoming electrons to molecules moving rapidly, whereas in the case of acetonitrile molecules isolated by icy surfaces, a chemical reaction took place. It is believed that acetonitrile is a precursor of amino acids, and the reaction product, on which scientists are still working to identify accurately; it is probably part of an intermediate step in the process that produces large organic molecules. The key point is that water is crucial for the interstellar chemical reaction, since this does not occur with pure acetonitrile.